With the Sun in Scorpio (deep, dark, forbidden) )and the Moon in Gemini (clever and duplicitous), today and tomorrow are Five of Swords days. There is no doubt this is the nastiest card in the deck. Emotions are divorced from intellect (the Sun and Moon are in 150 degree quincunx aspect = disconnect) and whatever that leaves running the show is decidedly not pleasant. For years, I saw this energy as one of ‘cut off your nose to spite your face’. From early times, five was considered a somewhat unusual – even rebellious – number and related to the discovery of the fifth geometrical body, the pentagon dodecahedron (consisting of 12 regular pentagons), that embarrassed Pythagoras (who had concentrated on the number four). Legend has it that the discoverer of the pentagon dodecahedron was drowned for his efforts. Ugh. Five has thus been regarded as a ‘naughty’, unruly number that like Eros (the number five is also associated with love), stirs up the well-ordered cosmos. When considering the Five of Swords, it’s key to ask yourself with which of these three figures do you identify. It would not be unusual for this to vary with time, place, and mood – but if it doesn’t – that tells you something else again. Clearly someone in this card has been ill-treated – abused or betrayed or otherwise taken advantage of – and because this card is one of separation, there’s a sense of disgrace and alienation. Most will see in this a win/lose situation where an odious victor has vanquished his two rather pathetic opponents. But if you look closely, the middle figure does not hang his head as does the farthest figure and he walks in a different direction. 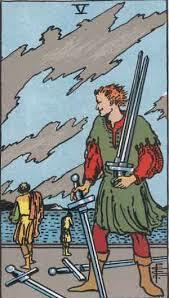 This leads us to the supreme challenge of a Five of Swords day. Will you remain complicit in adversarial ‘win/lose’ situations such as depicted in this card or will you have the courage to walk away and play by more humanitarian rules?